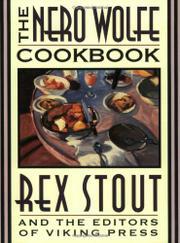 For many years Nero Wolfe, that stylish stout creation, has been royally served comestibles which demand a certain degree of dedication as well as artistry, from sweetbreads in Bechamel sauce to marrow dumplings to many variant versions of shad roe and duck and kidneys. There are simpler dishes, of course -- eggs which should never be fried any more than potatoes, muffins and hot breads, even the lowborn scrapple. Although you might flinch at squirrels and starlings. Most of the recipes have their provenance in the novels, courtesy of one Fritz Brenner. They all entail gourmandise and expertise carried to the nth calorie.